Our fall and winter has been filled with some exciting “joys of homeownership” issues. 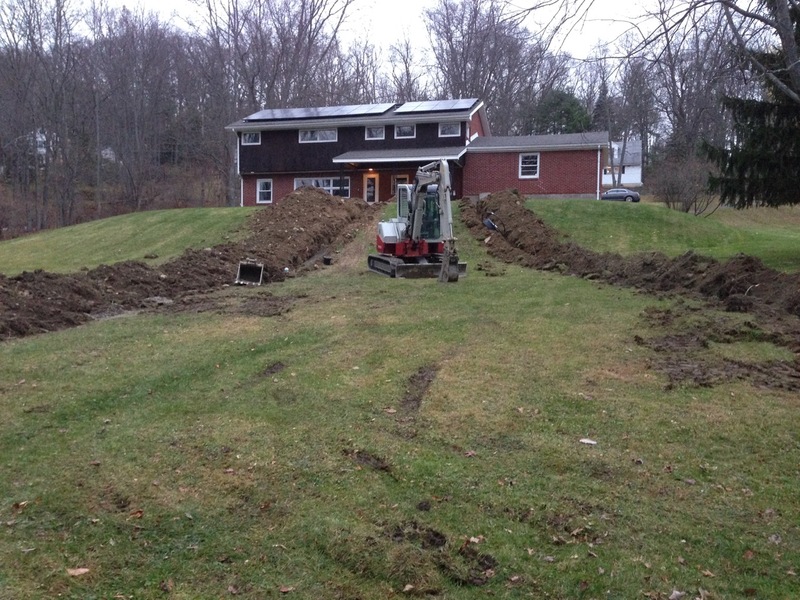 In November we noticed that we were having a problem with the sewer line, which started to drain very, very slowly. Fortunately, since we live on a large sloped lot, this didn’t really result in any disaster for us, but it clearly had to be corrected. About halfway down the backyard hill, we suddenly had a very green area of the lawn, even into late October. 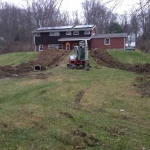 In our house, the sewer line comes out the back of the house, and runs approximately 100 feet to a manhole on the edge of our property. 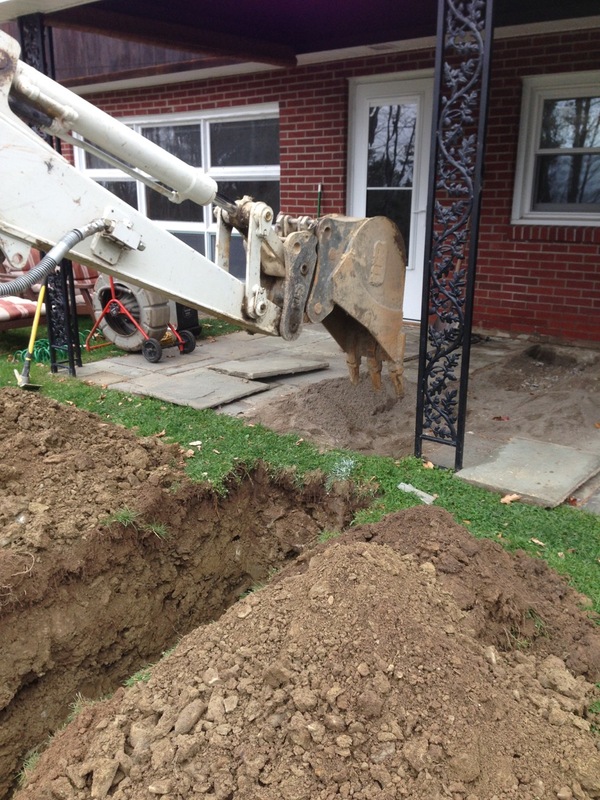 A quick call to our local plumbing service to check things out led to us having an excavator dig the potential problem area up as we couldn’t successfully snake out the problem. This revealed…a whole lot of nothing, except that the line was terra cotta tile. Usually this means that the clay tile has either collapsed or become clogged with tree roots somewhere, but we weren’t entirely sure exactly where that was. 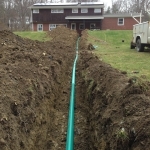 Mary and I made the call to have the whole line replaced – replacing only part of it would have been technically cheaper, but there is the possibility that the remaining parts of the line would have required service at some point in the future. Since we already had paid for the excavator and the time, replacing the whole thing with new SDR 35 (PVC) pipe and never worrying about it again seemed like a good choice. SDR 35 pipe has a gasketed bell joint – each piece fits together tightly and securely – so it effectively stops roots and other problems before they start. When digging the line up, we found two things: first, halfway down there was a cleanup buried in the ground. If we had known that was there, it may have been handy. Second, the upper half of the pipe was terra cotta, but the bottom half was cast iron pipe. (the roots had grown into the cast iron section very close to the manhole.) This leads me to believe that my grandparents possibly replaced a portion of the sewer pipe, possibly in the 1970s or 1980s. Unfortunately that’s a detail I can’t really find out currently. Of course, we’re coming into spring and I have a new challenge: getting the backyard cleaned up. 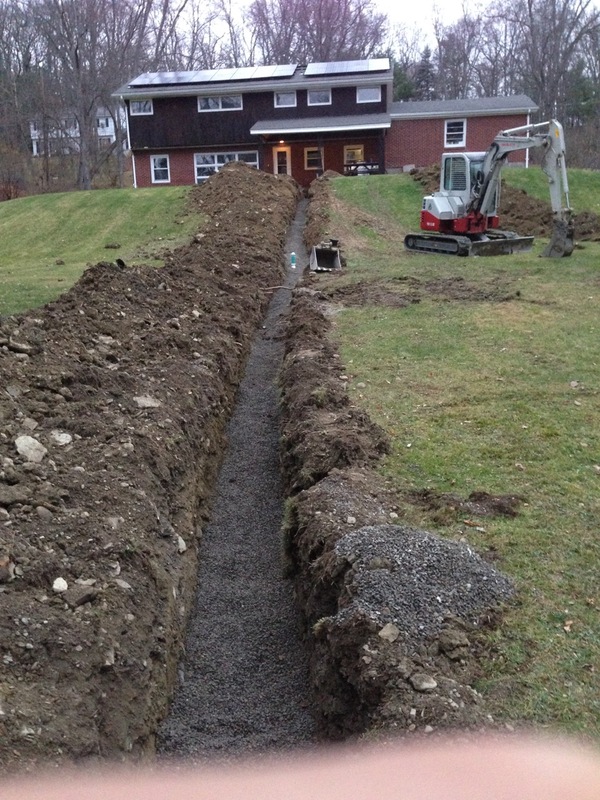 An excavator digging a giant trench across your lawn leaves a heck of a rocky mess to clean up. 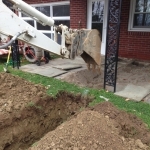 This entry was posted in exterior and tagged sewer line replacement on March 17, 2016 by Douglas Camin. Memories! We had a similar experience. 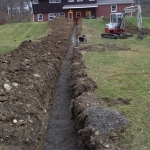 I opted to have the whole dug, lay the new line (with my wife’s help), then have them fill the hole. Our neighbor drove by on Christmas eve and was surprised to find us both in a 5′ deep hole at the main line connection. Memories! Fun times, yes! As a side note – I got the Modbox all modded with the paper box a few weeks ago. It came out well! Pictures and and instructions will be coming your way shortly! 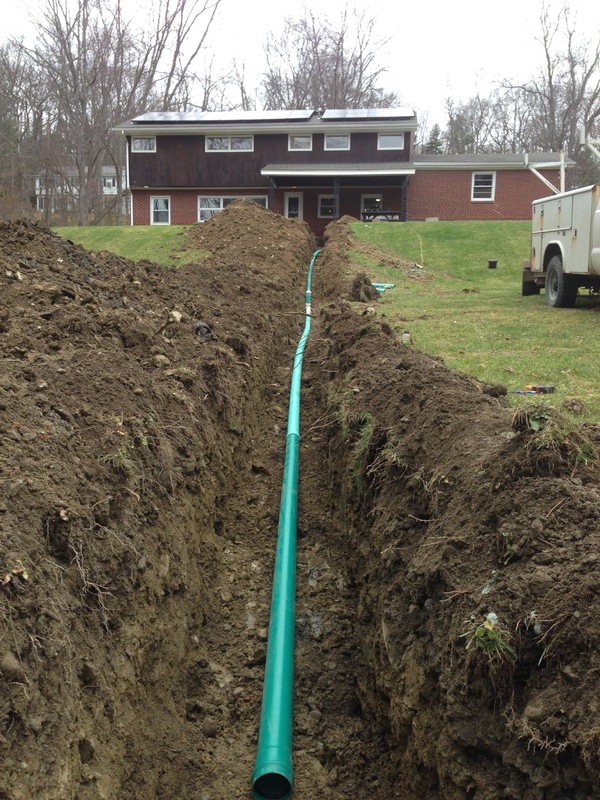 Did You look into trenchless replacement? I’m just wondering from a cost standpoint. I’ve never seen an estimate for the method. They send a breaker head through the existing pipe to shove the old pipe out of the way and pulls a new pipe liner through. I didn’t, but I also don’t know of a provider of that service in our area to ask. The way that I ended up doing this, it cost approximately $3,000 to replace 100 feet of pipe, totally replace the connection at the manhole chiseling out the cemented pipe and replacing it (if we hadn’t done that, it would have been $2,200 because that made us unable to finish in a single day), and have a secomd trench dug with 1 inch chase pipe laid to the new shed location (would have probably cost me $500-600 on its own to do renting a ditch witch.) So in total I felt the deal I got was decent enough. 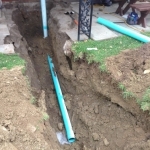 I pay about 10 dollars a month to Va. Power to dig it up and replace the water and sewer line for free should it break. Given the house was built in 1955 it is worth it. 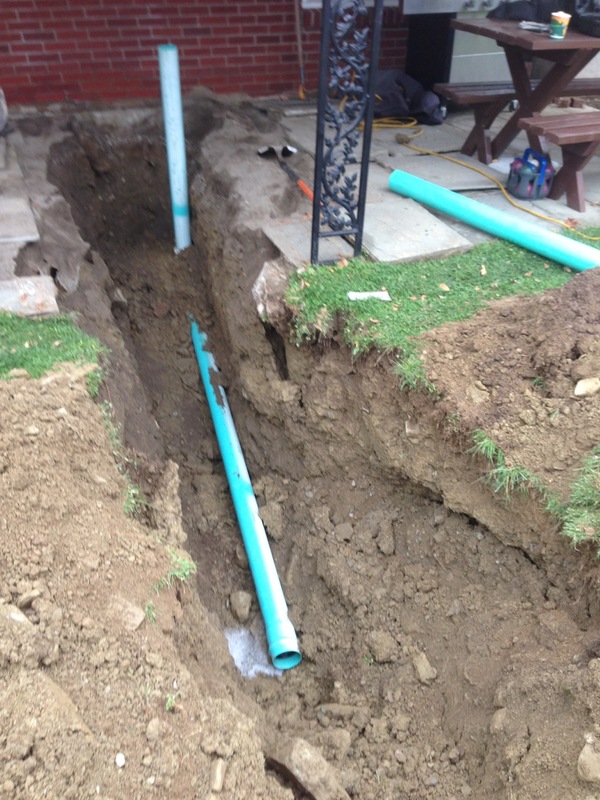 My dad had his water line break and replaced for free. We don’t have that option around here. Your utility is essentially offering an insurance policy. That’d be nice to have! Yes and with a huge oak tree over it.